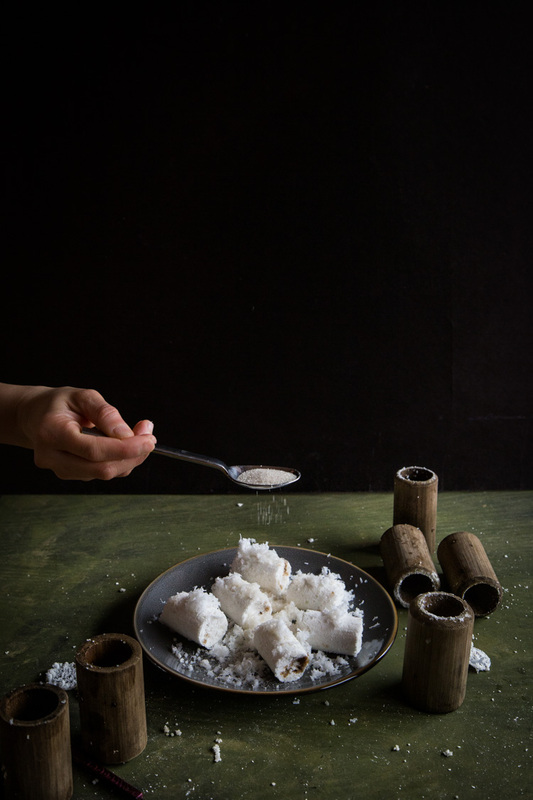 Putu bambu is an Indonesian steamed rice cake originating from the Tamil puttu. 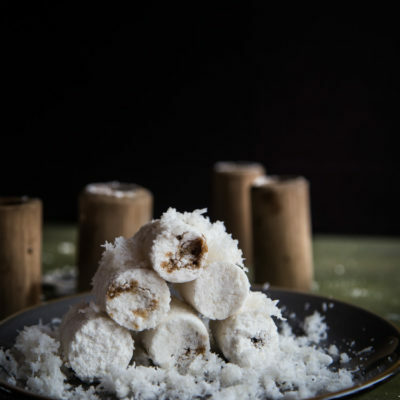 It consists of rice flour stuffed with palm sugar and steamed in Bamboo tubes and then topped with grated coconut and sprinkle of sugar. 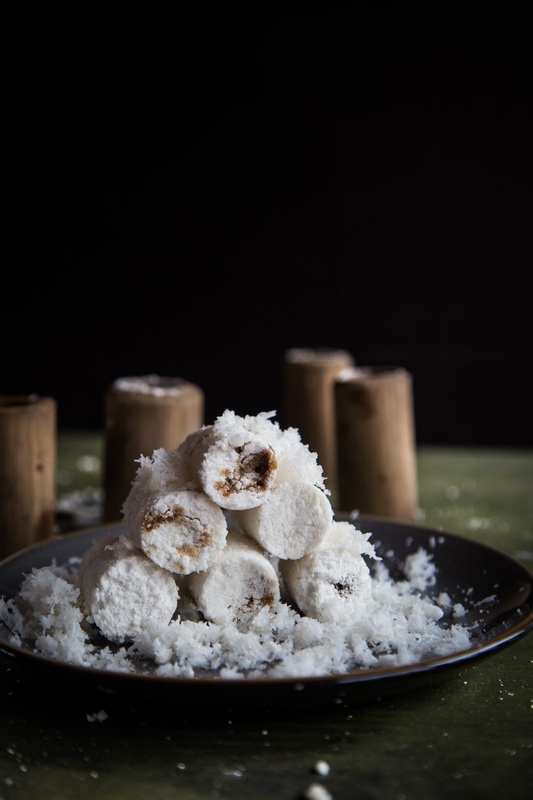 It is quite similar to Putu Piring or Kueh Tutu in Malaysia and Singapore. They are made using a special mould. 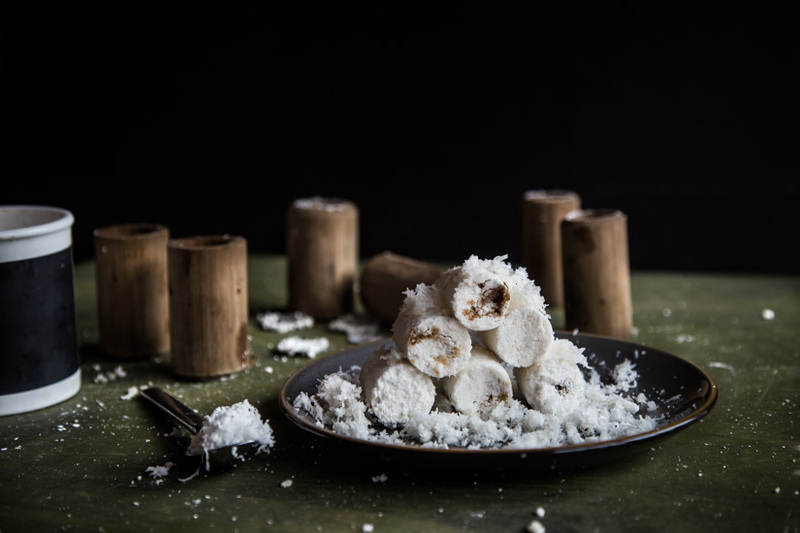 Putu bambu are steamed in the bamboo tubes in Indonesia. Of course I couldn’t find the bamboo pipes here in the United States. The only reason I have these because I had my mom brought them over. She actually bought them from the Putu Bambu seller who custom made them for her. The bamboo pipes set comes with of course the pipes and the little coins. The pipe has three spikes inside to hold the coins. I’m still wondering why they designed it like that. Why not just create the pipe that has a bottom. But I finally understand that they need the steam to go through from the bottom of the steamer and it’s easier to create it the way it is now. 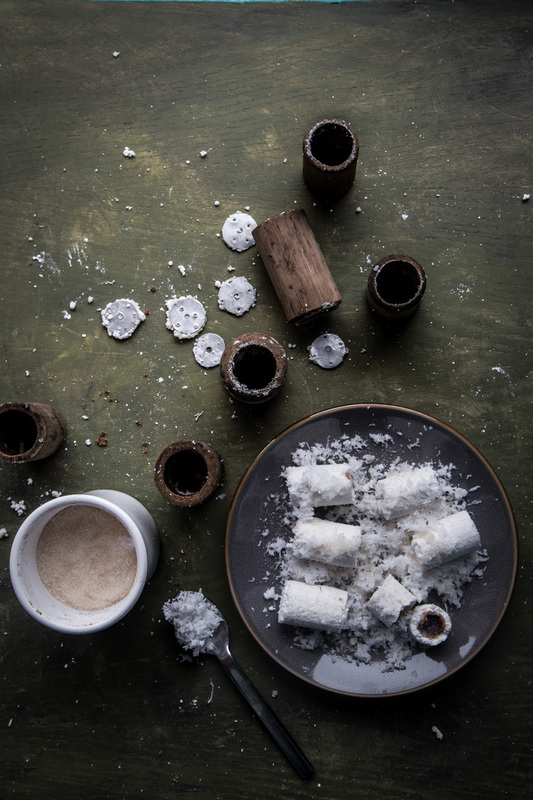 I had failed probably at least 5 times making this putu bambu. The cake came out gummy and rubbery all the times (see my recipe notes). Until I finally tried the real Tamil puttu recipe and BINGO ! 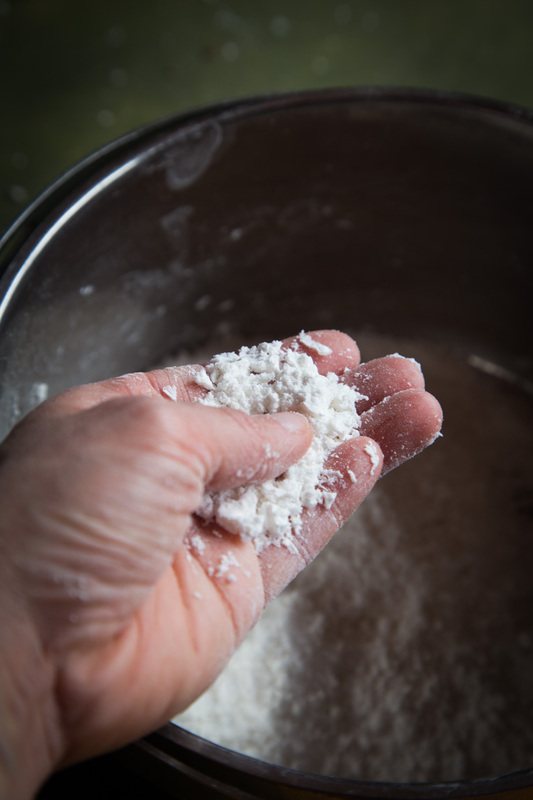 I was finally able to get the rice flour mixture to the right consistency. 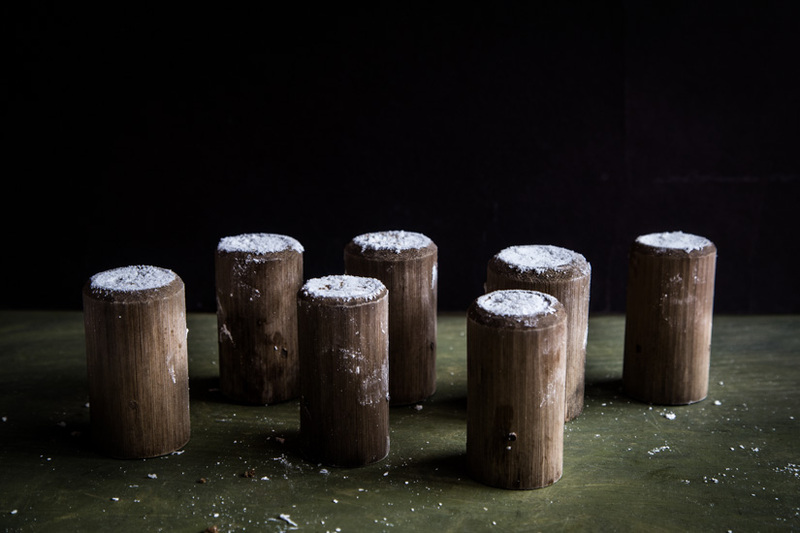 My recipe inspiration and how to steam it with idly maker and using puttu maker are from here. Pushing the steamed cake out. One of the best parts ! This is amazing! – Thanks for sharing. 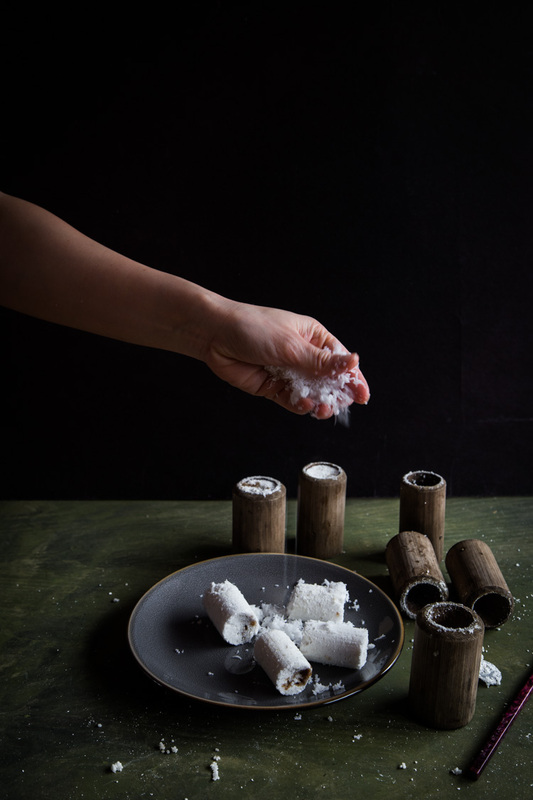 By the way, where did you get your putu bambu mould? Did you buy them from Indonesia – Medan? Or Online? Thank you for stopping by. My mom actually got it from the putu bambu seller (at Jalan Asia I think!). The guy actually custom made them for my mom. 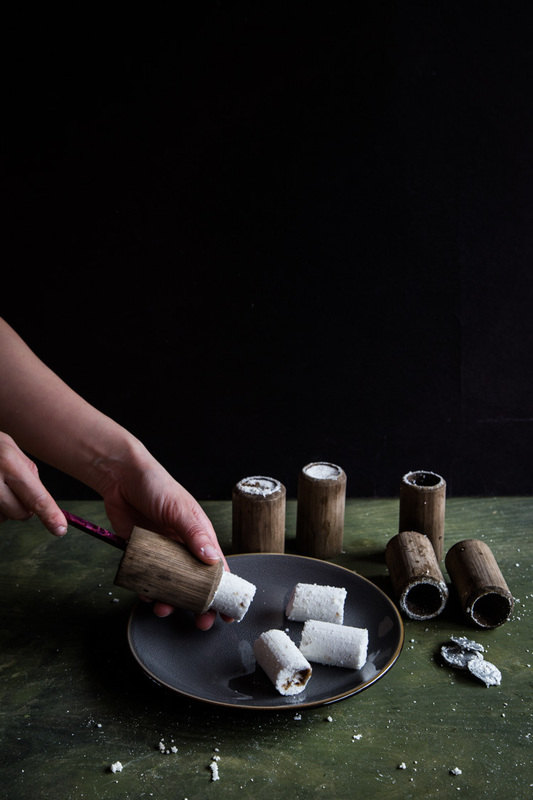 I don’t think you can buy the bambu mould online 🙁 Though like in my post, there is a putu maker that is used in India (Amazon sells it), but it’s in bigger size. Thanks for sharing this recipe – my grandpa used to buy this for us… then my dad also bought lots of this when we were kids as midnight snack! 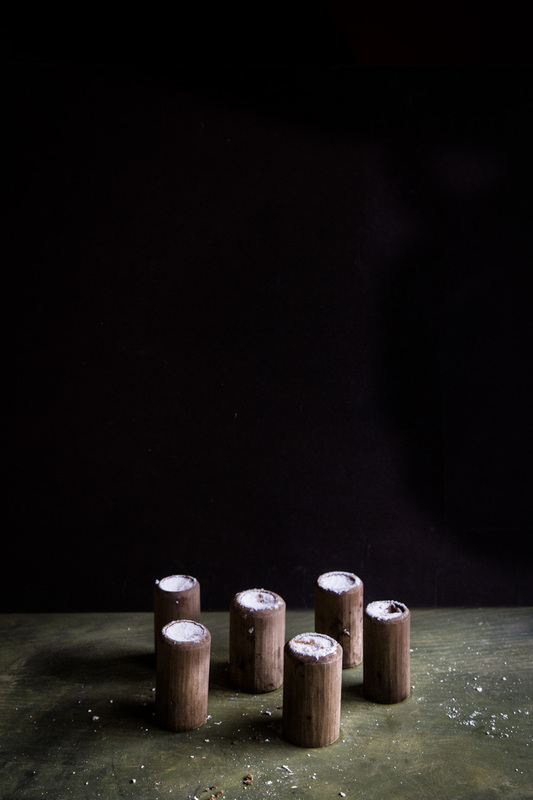 I have the same bamboo tubes, tried 3 times with rice flour I ground from soaked and drained rice….failed miserably and given up after wasting loads of my precious gula aren….texture was rubbery. Might give your recipe a go soon. 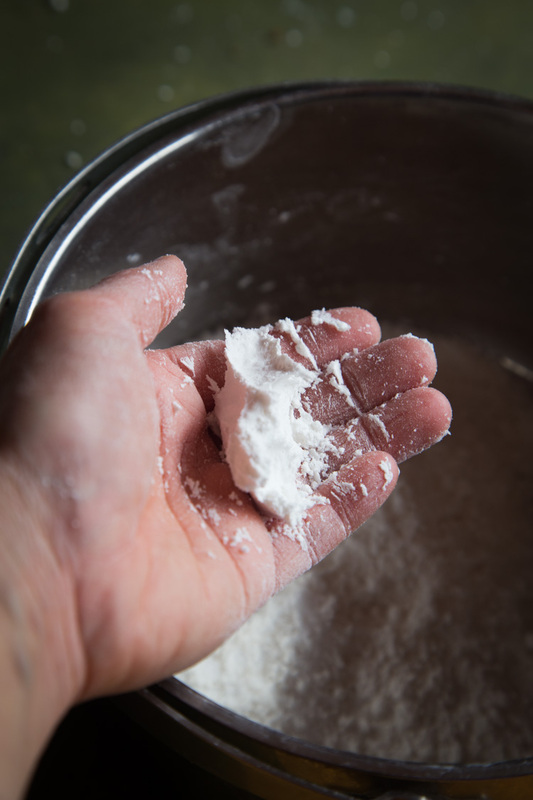 Another problem I had was the sugar leaking through during the steaming process. I have to agree with you that it’s pretty challenging to get the texture right. 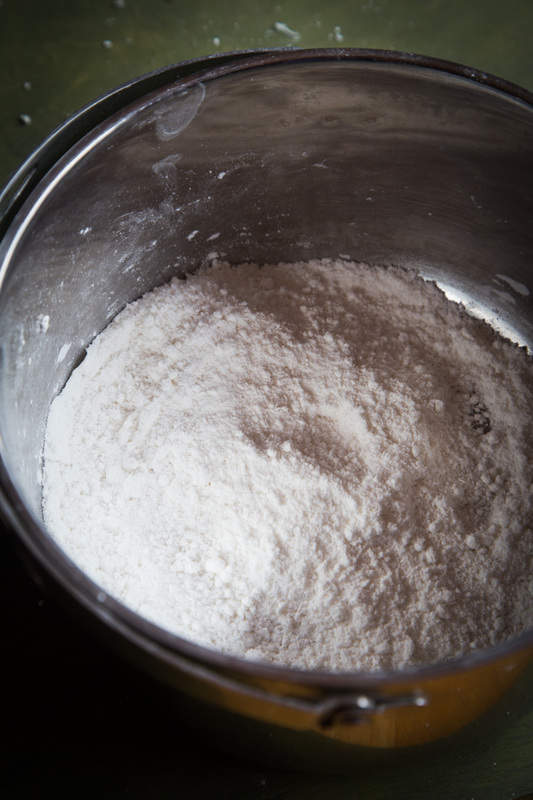 I haven’t tried with homemade rice flour before and so I’m not sure if the amount of water will be the same because I use store-bought rice flour. If you have a chance to try out the recipe, Let me know how it turns out. I hope it turns out for you this time. Fingers crossed!